A building's central air-conditioning system must be periodically inspected and maintained in order to function properly. While an annual inspection performed by a trained professional is recommended, homeowners can do a lot of the work themselves by following the tips offered in this guide. The exterior condenser unit is the large box located on the side of the building that is designed to push heat from the inside of the building to the outdoors. Inside of the box are coils of pipe that are surrounded by thousands of thin metal "fins" that allow the coils more surface area to exchange heat. Follow these tips when cleaning the exterior condenser unit and its inner components -- after turning off power to the unit! Remove any leaves, spider webs and other debris from the unit's exterior. Trim foliage back several feet from the unit to ensure proper air flow. Remove the cover grille to clean any debris from the unit's interior. A garden hose can be helpful for this task. Straighten any bent fins with a tool called a fin comb. Add lubricating oil to the motor. Check your owner’s manual for specific instructions. Clean the evaporator coil and condenser coil at least once a year. When they collect dirt, they may not function properly. Inspect the drain line for obstructions, such as algae and debris. If the line becomes blocked, water will back up into the drain pan and overflow, potentially causing a safety hazard or water damage to your home. Make sure the hoses are secured and fit properly. Air filters remove pollen, dust and other particles that would otherwise circulate indoors. Most filters are typically rectangular in shape and about 20 inches by 16 inches, and about 1 inch thick. They slide into the main ductwork near the inside fan unit. The filter should be periodically washed or replaced, depending on the manufacturer’s instructions. A dirty air filter will not only degrade indoor air quality, but it will also strain the motor to work harder to move air through it, increasing energy costs and reducing energy efficiency. 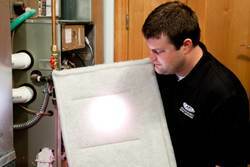 The filter should be replaced monthly during heavy use during the cooling seasons. You may need to change the filter more often if the air conditioner is in constant use, if building occupants have respiratory problems, if you have pets with fur, or if dusty conditions are present. When the cooling season is over, you should cover the exterior condenser unit in preparation for winter. If it isn’t being used, why expose it to the elements? This measure will prevent ice, leaves and dirt from entering the unit, which can harm components and require additional maintenance in the spring. A cover can be purchased, or you can make one yourself by taping together plastic trash bags. Be sure to turn the unit off before covering it. Air-distribution registers are duct openings in ceilings, walls and floors where cold air enters the room. They should be closed after the cooling season ends in order to keep warm air from back-flowing out of the room during the warming season. Pests and dust will also be unable to enter the ducts during the winter if the registers are closed. These vents typically can be opened or closed with an adjacent lever or wheel. Remember to open the registers in the spring before the cooling season starts. Also, make sure they are not blocked by drapes, carpeting or furniture. 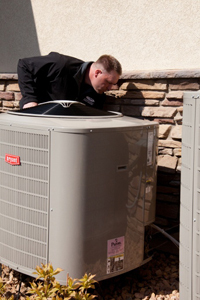 Have the air-conditioning system inspected by a professional each year before the start of the cooling season. Reduce stress on the air conditioning system by enhancing your home’s energy efficiency. Switch from incandescent lights to compact fluorescents, for instance, which produce less heat. In summary, any homeowner can perform periodic inspections and maintenance to their home's central air-conditioning system.